When you decide to remodel your kitchen, it can be easy to go overboard and to throw your budget out the window without even realizing it. The good news is that you don’t have to sacrifice the style of your remodel to get all the upgrades and aesthetic appeal that you crave. Learning to prioritize, comparison shopping, and deciding what is really a priority can have you not only having the remodel of your dreams but one that is within your budget too. 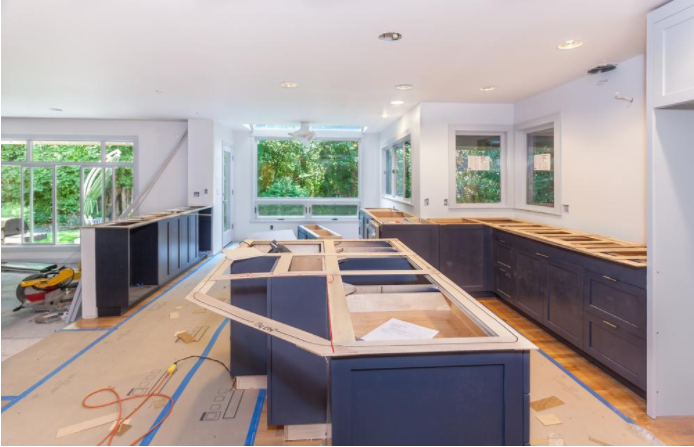 If you have hired a interior renovation company to remodel your kitchen, then that can put a huge strain on your household. Not having access to a kitchen can cost more because you may be limited to eating out or grabbing meals as you go, which can really start to add up. One of the best ways to cut your home remodeling costs is to try to get your renovation done as quickly as possible. The key is to have a design ready to go, stick to it, and not vary so that you are back making dinners in the kitchen of your dreams in no time. One of the biggest costs of renovating a kitchen is moving appliances around. If you don’t have to, try to leave things where they are. The refrigerator is the easiest thing to change in the layout because all that it requires is that you have a 120-volt outlet to plug it into, and if you have an ice machine you might need a water supply line. If you choose to move the stove or range, you can be looking at moving either the gas or the electric line that supplies it. Although this doesn’t seem like a big deal, electricians and plumbers charge by the hour; depending on where you have to move the line, it can take as much as a full day’s labor, which is a huge expense. So, if you can, keep the layout the same and work with what you have. One of the biggest places to spend your budget is in the quality of the cabinetry. Most homeowners put so much thought into everything else and then when it comes time to pick the cabinets, they try to save money by buying less expensive cabinetry. Since the first thing that anyone will notice is your kitchen cabinets, it is best to invest in good ones that will withstand the wear and tear that you and your family will put on them. Consider adding shelving to save costs, so that you can use upgraded cabinets to make a real impression. If you are going to add an island, make it about more than just seating. Islands are one of the best ways to maximize your storage; add nooks and crannies so that it can house all the things that you don’t want anyone to see. Just make sure to leave a minimum of 36 inches around it for clearance – more if you have more than one cook in the kitchen at a time. Materials are one of the biggest costs to any kitchen remodel. When choosing which type of countertop or backsplash you want, try to be realistic. Sure, using trendy material will upgrade your kitchen. But unfortunately, it will also age it. Choose materials that might cost a little more but are sturdy and will look good for a long time. Choosing impractical materials like marble or soapstone – which are very expensive – might be alluring. But there is nothing alluring about those materials staining or chipping. Sometimes the high-end materials will make your kitchen spectacular initially but will end up making it look shabby quickly. Try to stick with middle-of- the-road materials that will last and stay away from ones that need too much TLC. When choosing appliances, try not to get caught up in name brands or innovative products that you don’t need. Having the internet on your refrigerator might be a cool conversation piece, but that is about all it is. Choose appliances that will benefit the look of your kitchen without breaking the bank. Kitchen remodels can be expensive and disruptive. Try to minimize both by keeping a layout that works fine where it is, prioritizing where you want to spend your money, and not skimping on the things that mean the most, and you will have the kitchen of your dreams in a timeframe that you can live with.